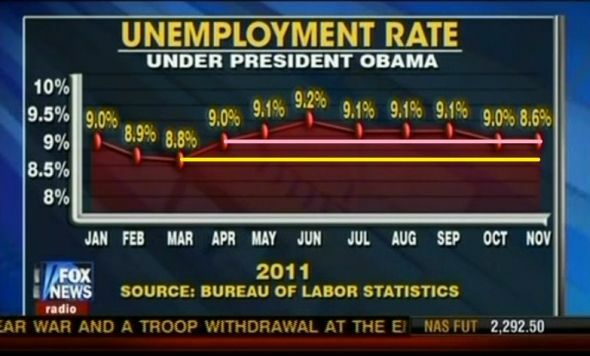 Today In Dishonest Fox News Charts | Media Matters for America. As someone who creates graphs like this every day, analyzes tons of data, and tries my utmost to stay true to the math…THIS IS WHY I HATE FOX. They lie, flat out, straight up, lie, each and every day, all day long. They give pretty much every thing I enjoy doing a bad name. They are, as far as I can tell (and that’s pretty far now with the investigations), an international criminal organization. Lying to their viewers is the *least* they can do, and it’s done all the time. In true sickness format, they’ll spend most of tomorrow making up lies about the source of these screenshots, and passing along rumors and inuuendo as fact. After all, tomorrow is a day ending in “y” and those are the only kinds of days when Fox is lying to you. When is 8.6% bigger than 9.0%? When Fox is doing the math.